Is this a 'too good to be true' product? This machine is now a bargain given that the operating system itself costs more than two-thirds of the price tag. Unfortunately, it sports a slow processor and unless you can live with that, you'd better look elsewhere. We don't usually review products that have been out for a few years but the Asus Eeebox PC EB1033 was simply too much of a good deal to ignore, at least on paper, especially as one UK retailer, Ebuyer, is selling it for just under £100 (around $155, or AU$210) and sent a machine over for a review (better late than never). At that price, it competes with the HP 260 G1 which we reviewed last month. Both devices share a number of similarities including the price and a pint-sized form factor. The EeeBox EB1033 is one of the thinnest desktop computers we've tested to date. (Obviously, tablets and laptops are even thinner but that's not the point). Compared to traditional PCs, this model uses a fraction of the material needed and has a recyclability rate of more than 90%. While some may be quick to describe it as an HTPC (Home Theatre Personal Computer), the EB1033 is just as well suited for a business environment thanks to a slew of features. With a thickness of just under 3cm and weighing 700g, it is great for those looking to save space on an already crammed desk. It comes with a stand as well as a rotatable VESA mount kit should you want to hide the EeeBox PC behind a monitor. Note that its power supply unit is an external 65W model that resembles a laptop power pack. The front of the EB1033 houses, from top to bottom, an SD card reader, a power button, four USB ports and two audio sockets. Turn it over and you will discover a power socket, D-Sub and HDMI connectors for video, an Ethernet port (GbE), an antenna socket and two USB 3.0 ports. This PC comes with a 64-bit version of Windows 7 Home Premium, useful as you can get up to 4GB of RAM on it; as such you should be able to upgrade to Windows 10 almost immediately. Given that Windows 7 HP costs about £68 by itself, the EeeBox EB1033 turns out to be a pretty good deal. Things turn sour though as you turn on the computer and discover that it is powered by an Intel Atom D2550, a three-year-old CPU that, despite offering two cores clocked at 1.86GHz, is still shackled by its Cedarview origin and its 1MB L2 cache. The rest of the configuration consist of an Intel NM10 chipset, 2GB of DDR3 memory expandable to 4GB, the maximum supported by the D2550, a 320GB SATA HDD spinning at 5400RPM, a discrete Nvidia Geforce 610M GPU and 802.11b/g/n Wi-Fi. 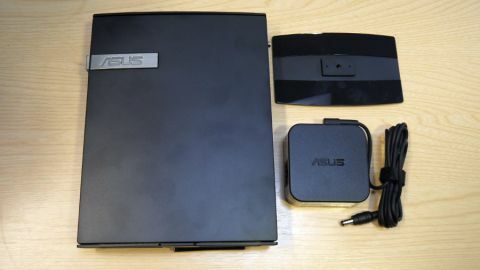 Asus has also bundled a number of applications including its own energy monitoring software as well as Adobe Acrobat Reader, Asus Vibe Fun Center, Trend Micro's Titanium Internet Security and a few other more or less useful applications. Having such a plethora of applications running concurrently at launch puts a load on the computer from the very beginning of your Windows session. The EeeBox EB1033 somehow manages to keep its calm consuming only 18W when idle and 27W when under load. Compared to the HP 260 G1, the EB1033 is about 45% slower when it comes to sheer CPU and GPU performance; it has a bigger but slower hard disk drive and Wi-Fi though. Its general performance was on par with an entry-level Intel NUC and the Intel Compute Stick; both are powered by a Bay Trail-based Intel Atom processor. To its credit though, this Asus machine did complete more benchmarks compared to the two aforementioned products, both of which failed to deliver scores on a number of tests.